First, I need to thank Tony for indulging my midlife crisis here on the blog and agreeing to watch The Karate Kid and Cobra Kai with me. It may have been something he wanted to watch, but I was definitely a lot more excited about Cobra Kai when we saw the first trailer for it. 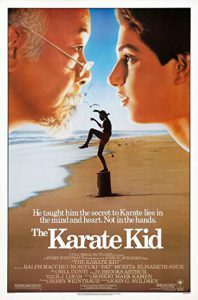 The Karate Kid is one of the movies from the 80’s that was a big part of my childhood. Tony and I watched The Karate Kid and the first 2 episodes of Cobra Kai before our accident, then after returning home from the hospital and being stuck on the couch with my foot in the air I watched the rest of the first season of Cobra Kai with my 19 year old son who is currently in charge of making sure I have what I need within reach and don’t overdo it and end up back in the hospital. So, part one here is the movie and the trailer for the new series and the rest will be broken up into as many parts as Tony thinks it needs. The Karate Kid is about an Italian-American boy who moved with his single mother from New Jersey to the Valley in California. He has a really hard time adjusting and becomes a target of bullies because he showed interest in one of their ex-girlfriends. He befriends a sweet old man who takes pity on him and to get the bullies to leave him alone, enters him in a tournament, and teaches him karate so that he can defend himself. Like many movies from that time, I didn’t see it in theater. We didn’t grow up poor, but my dad was frugal. We had HBO and a VCR, so we taped and watched the movies we liked over and over. When we decided to watch The Karate Kid, it had been the first time I had seen it in a very long time, maybe as many as 20-25 years. When you revisit movies from your childhood it is a little scary, because sometimes they hold up well, and sometimes they don’t. From The Karate Kid we learned that when you work hard, even if you don’t see the connection between your labor (wax the car/sand the floor/paint the fence) and the learning that is taking place, you can reach your goals. I learned how to pop a clutch form watching The Karate Kid. It might be useless information today, but about 15 years ago knowing how to pop the clutch meant I got the car back home and didn’t have to pay a tow bill. I didn’t learn karate, but I was exposed to a different culture. That isn’t something I appreciated as a kid, but it is something that I feel is important for our kids and grandkids not only to be exposed to but to talk with them about. It’s always fun to watch movies and see the hair, the high-waisted pants, how they use different phrases, and the old cars and buildings. There are a couple of things I missed as a kid. I understood Mr. Miyagi’s wife died in childbirth while he was at war. I had no idea she died in child birth at a Japanese internment camp while he fought with the U.S. against Japan. I caught that Daniel wasn’t supposed to get the girl, but I thought it was because she was rich and he was poor. The fact that she was white and he was an Italian kid from the east coast was completely lost on me. Also, in the bathroom before Daniel turned the hose on him, was Johnny rolling a joint? I thought it was a cigarette when I was a kid, I’d only been around a few people who smoked, and never saw them roll their own, but I didn’t know anything about marijuana and was honestly surprised when I watched it this time around. Things to keep in mind about movies of the 80’s. When it comes to sexism, it was before Anita Hill and sexual harassment was recognized as a problem, but that doesn’t mean it wasn’t or that many young women didn’t try to fight it. Racism in California in the 80’s may or may not be different than it is there today. I would have to watch the whole movie over again to see if there was a single African-American in the film. It seemed to be white vs. non-white and the non-white consisted of the Russos (Italian Americans from New Jersey and Mr. Miyagi who immigrated from Okinawa, there may have been more examples, but I would have to also look for that in a re-watch. Classism was obvious as I pointed out above. This brings us to Cobra Kai and why was I so excited when I saw the trailer. They were people from my childhood as adults and I wanted to know how they turned out as much as you want to know what happened to those people from high school you lost touch with. Did they grow into decent human beings? Did they get what was coming to them for being giant assholes? Are they still sweet and amazing people after the big bad world chewed them up and spit them out, or are they jaded? Specifically though, I wanted to know, what happened to Johnny? We never learned why he was the way he was. We saw a guy who thought he should be able to control who his ex-girlfriend spent time with. He appeared to be entitled and to embody what we now refer to as toxic masculinity. So, did he become a monster like his sensei? Did he quit karate? We see him at the beginning of the trailer on the ground with a beer can just out of reach. We see Daniel is successful, but how did he get there? Is he a good person? Because of their history together, we might be able to anticipate where this is going, but now Johnny wants to teach karate and Daniel is afraid of him being like his “No Mercy” sensei. I am as interested in the story and where it is headed as I am about why this matters so much to me. Reflecting on turning 40 and looking at the movies of the time period that shaped my understanding of the world. Maybe you’re about my age and you get what I’m working through here, or maybe I’m old enough to be your mom and your Karate Kid has Will Smith’s son in it and you had Jackie Chan as Sensei. If you have not seen the original Karate Kid movies from the 80’s and are watching them for the first time, watch it with someone who remembers the 80’s. If I am out of work long enough, then I might just get around to your Karate Kid. I watched Cobra Kai, and then went and re-watched Karate Kid. I also totally missed the whole internment camp thing when I was a kid.